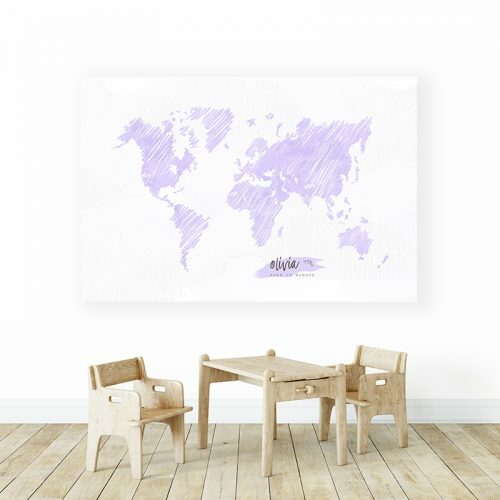 Let this luxurious, unique and Personalized Sketched World Map make your kid’s bedroom, playroom or any room a delightful place for your precious little one to grow in! And help us save kids: 5% of all profit is donated to Mending Kids. Designed and personalized for you with love and extra care in Canada. Museum-quality print made on thick, durable, matte paper. Printed on archival, acid-free paper. Care and maintenance: wipe with a soft dry cloth. 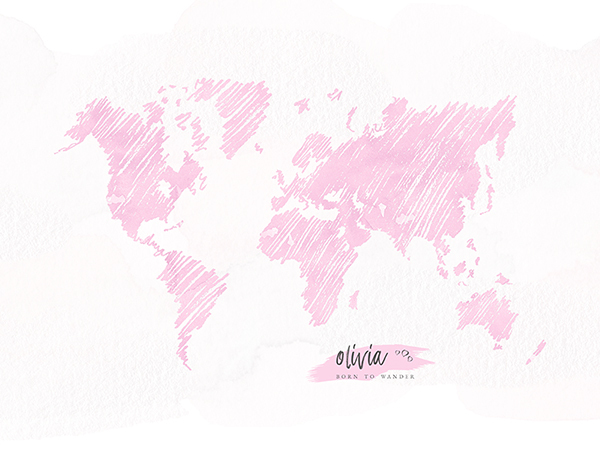 Your favorite wanderlust quote, name, travel dates… or nothing at all! Your wall art will be shipped in a tube. First, click the “Add to cart” button and purchase this gorgeous wanderlust wall art. Please take note that I don’t make proofs before the order has been placed (sorry for any inconvenience). Then, please fill in your custom quote, name, and dates (if wanted) in the “Order Notes” of the Checkout page and make sure you didn’t do any errors or misspelling. I will make a proof for you and I will send it to your email for approval. You can request up to two revisions to this proof included in the price. The revisions don’t include a color change of the map. You can request modifications to the quote, name, and dates. In the very rare event that you still need to modify your design after two rounds of revisions, each additional revision would cost $5, paid before the map is sent for printing. Once the proof has been approved by you, I’ll send the map for production. This is a custom designed and printed product. Processing times may vary depending on the number of revisions. For shipping and delivery times, please visit our FAQ page. In a rush? Please message me with your deadline, the product you are interested in ordering, its size and your zip code. I do offer rush production and expedited shipping for an extra fee. For more information, please read the additional information provided in the next tab or head to our Help and FAQ page. Please help us save kids! By purchasing this wanderlust art, you are paying it forward to sick kids around the world that don’t have access to good medical care. 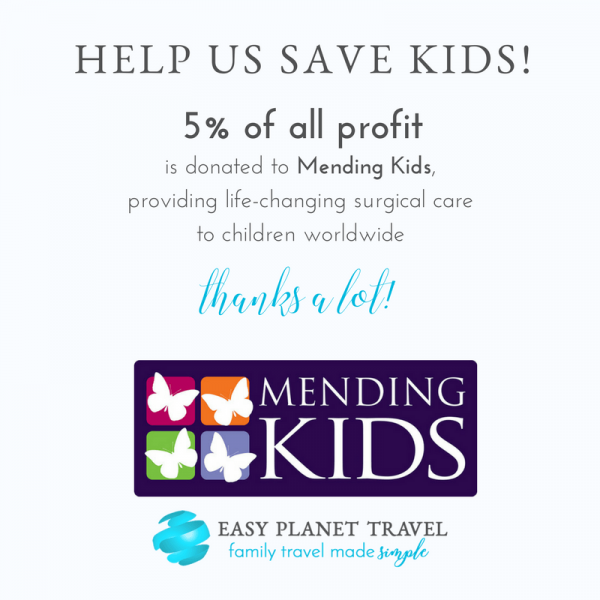 Yes, 5% of all profit is donated to Mending Kids, providing life-changing surgical care to children worldwide. This product is a custom or personalized product. 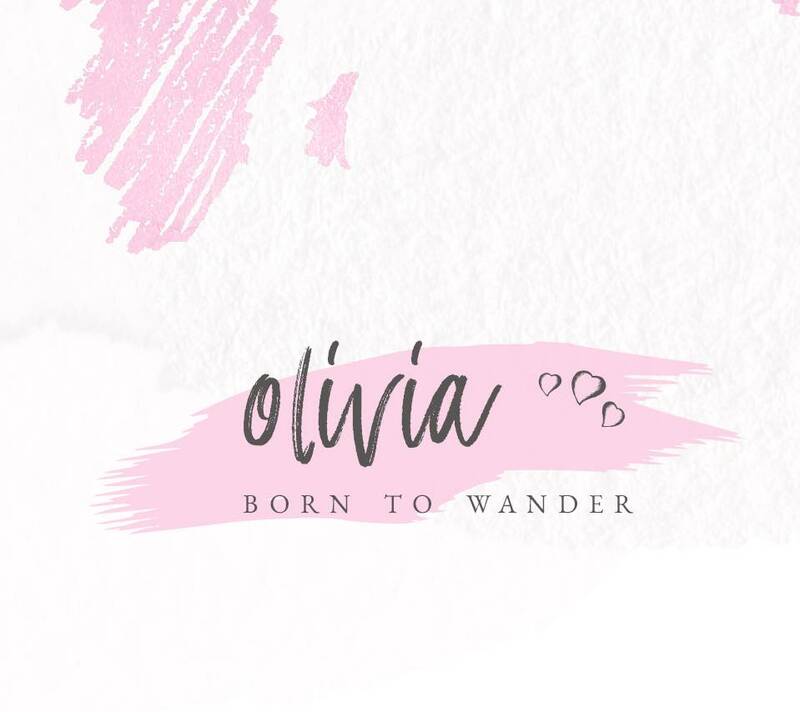 To personalize this product: On the "Checkout" page, in the "Additional Information – Order Notes" blank field on the right side of your screen, next to your billing details, please write the name you want to be written on the wall art (for example: Ava), and your kid's birthdate (for example: March 6, 2018). If you haven't provided the name and birthdate on the Checkout page, please send that information to me by email ([email protected]) as soon as possible so I can start working on your wall art. The shipping and delivery time limit can only be achieved if you send your information on the day of your order. Every day that I have to wait for your customizing information is an additional day to add at shipping and delivery. 10" x 8", 20" x 16", 24" x 18", 36" x 24", 48" x 36"
We offer FREE standard shipping to continental US and Canada. Non continental US and Canada shipping is available for a flat rate of $35. For personalized items, your order will be shipped to you within 17 business days. Delivery services include the time it takes to process, print, dry, package and ship your order to you. For more information, please take a look at our Help and FAQ section (https://www.easyplanettravel.com/help-faq/). We stand by everything we sell, 100%. So if you’re not satisfied with your order for any reason, neither are we. We’ll make it right. – First, contact us by email ([email protected]) and let us know exactly what your issue is. – Then, we’ll work with you to find a solution that you’ll be happy with. Copyright Releases For Personal Use ONLY. Disclaimer: My maps are artworks and are not intended to be used for teaching purposes. They are made from real base maps made by cartographers. I knew that Easy Planet Travel had some cute stuff on her website but this map is on another level!! I adore it! Can’t wait to hang it in my apartment! 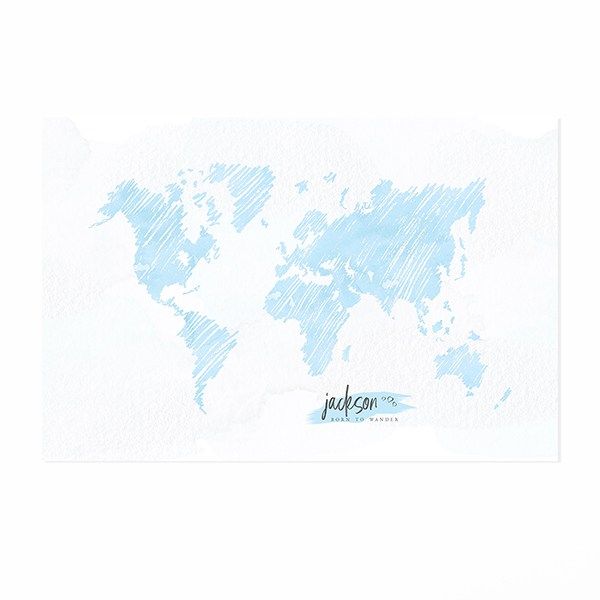 It is a beautiful artful world map. I really like the little hearts beside the name of our family. 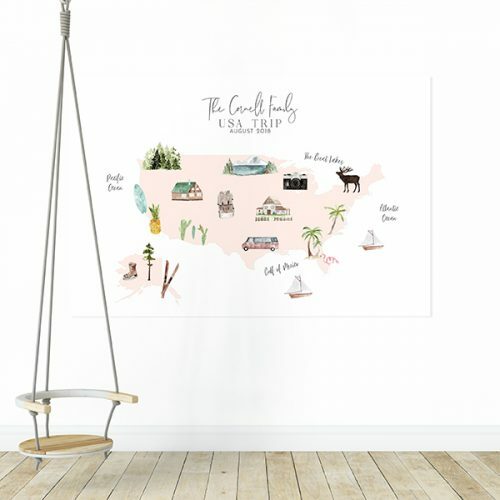 This print is a great way to add a little travel touch to a room. I like this design, and the turquoise color is beautiful. I just wished the map would take more space on the print… it is a little bit too small. Thanks a lot, Chantal, for the suggestion! I will definitely take your suggestion seriously and see if I can redesign this Sketch World Map accordingly. I’m currently working on a very detailed world map… you might want to look it up!